5016 Color: Brown Features: -Use the phone slot to easily notice incoming calls and messages while working on your laptop. 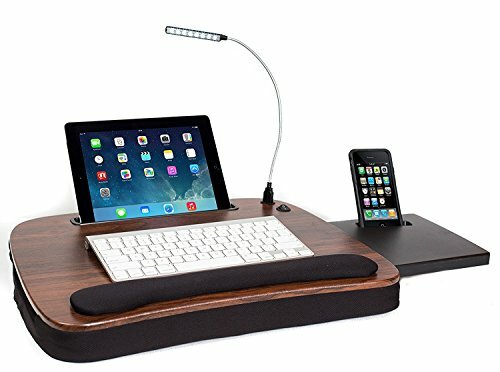 -Inlcuded USB Light lets you read and write or light up your computer's keyboard at night. -Keeps your lap cool and comfortable. -Built in handle for portability. -Includes soft memory foam along with a angled design that provides comfort and support. -Patent pending. Dimensions: -Slide out mouse deck: 75" L x 7" W. -Media slots for tablets 96" or smaller and smart phones 35" or smaller; tablet slot: 10" L x 0.75" W . -Smart phone slot: 35" L x 75" W. Overall Height - Top to Bottom: -3.5". Overall Width - Side to Side: -18.5". Overall Depth - Front to Back: -14". Overall Product Weight: -5.25 lbs. If you have any questions about this product by BirdRock Home, contact us by completing and submitting the form below. If you are looking for a specif part number, please include it with your message.